Here you will find useful information on directions and parking, booking options in restaurant and foyer bars and all our services relating to a particular performance. We hope you have a great time at the Deutsche Oper Berlin! On September 24, 1961 the Opernhaus that had been inaugurated in 1912 and destroyed during the War was reopened as Deutsche Oper Berlin. Ever since it has been Berlin´s largest and Germany´s second largest music theatre, featuring among the most modern institutions in Europe. The straightforward and elegant building that was realized by architect Fritz Bornemann (he also conceived the America Memorial Library and the Haus der Berliner Festspiele, a. o.) seats 1.859 and guarantees a maximum viewing and hearing experience for every visitor. 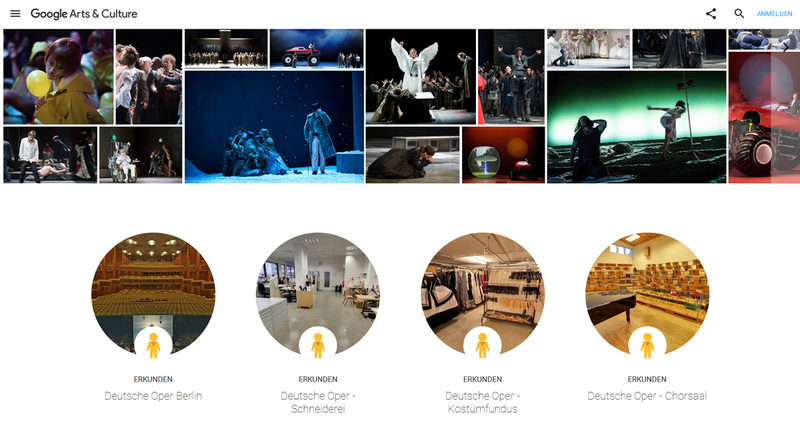 The Deutsche Oper Berlin in a virtual tour with views of the costume tailoring, the fundus, the choir and orchestra hall, with views on the stage and in the carpentry [Cultural Institute]. The box office will be closed on 4 November and 24 December 2018. Bookings can still be made by telephone, in writing and online. Upon presentation of a severely handicapped identity card designated »B«, severely handicapped persons can obtain a ticket free of charge in all price categories for the person accompanying them. The box office of the Deutsche Oper Berlin on Bismarckstraße is accessible, barrier-free, for wheelchair users. Four parking spaces for wheelchair-users are available near the main entrance at the corner of Bismarckstraße and Richard-Wagner-Straße. Lifts transport visitors who cannot walk to the desired hall and foyer levels; on Stalls 2, there is a special box offering comfort especially to wheelchair users; accompanying persons sit close by, in the 26th row of the stalls. If you have any questions, please do not hesitate to contact our Ticket Service under the telephone number +49 (30) 343 84 343. The Deutsche Oper Berlin is most easily reached by taking the underground line U2, which will bring you directly to the stop „Deutsche Oper“ from the direction of Ruhleben or Pankow. The stop „Bismarckstraße“ of line U7 is also very close by (there are lifts to the street level at this stop) as are the stops of the bus routes 101 and 109. If you prefer arriving by car, the Parkhaus Deutsche Oper is at your disposal starting two hours before the beginning of the performance until 2 o’clock at a charge of € 4,–. There are special conditions for subscription holders: you can obtain an outlet ticket at the first cloakroom to the right upon presentation of your parking-structure ticket for only € 3,–. You may of course use the parking structure during the daytime as well, either as a regular parking space for your job, a comfortable parking space for residents or as additional parking spaces for clients and employees. The garage is open 24 hours. The Restaurant Deutsche Oper greets you as a guest not only at the interval foyers, but also every day from 9 h in the restaurant, offering high-quality, light German cuisine with excellent service. You can dine there before or after the performance together with friends or artists. At the website www.rdo-berlin.de, you can find the complete menus for food and drinks for the bar area in the foyer and the Restaurant Deutsche Oper. You may of course reserve places, whether for a visit to the Restaurant Deutsche Oper or for drinks and snacks during the interval of a performance. At the Deutsche Oper Berlin we lend out and sell the opera glasses SCALA from the company Bresser. They can be borrowed by the first two coat checks on the left and right, and from the ushers at the hall entrances for a lending fee of € 3, with provision of your personal ID as a deposit. Reservation is not possible. They are sold at the first two coat checks on the left and right for the price of € 45. The Shop „L&P Opernshop“ has a high-grade selection of literature, books about the arts, cultural and theatre magazines as well as CDs and DVDs. The shop is open 1 hour before the beginning of the performance and until the last interval.